Five foundation year students participated in the Business Scholars Day Program in early April at 271 Collins Street. Mixing with Monash University students, they participated in simulation exercises and workshops and heard presentations from industry speakers. The session provided a great insight into both their future studies and their future careers. The day's program was engaging and comprehensive. Kate Galati, Senior Student Recruitment Coordinator and Mark Crosby, Director of Bachelor of International Business, welcomed students and set the tone for an interesting day. "It was fantastic to welcome high school students to business scholars day and to have them see both the facility and the way that we teach," Director Mark Crosby said. "I enjoyed presenting the "Chair the Fed" icebreaker game, and to help them learn some economics in a fun and interactive way, but also by learning from their peers." 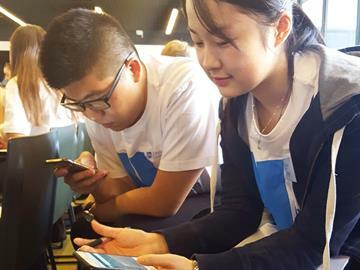 Our foundation year students, Devon, Amy, Eugene, James and Thervy, engaged in an icebreaker called 'Chair the Fed', a Monetary Policy game on their mobile phones. The goal of the game was for students to work in small groups towards being reappointed as 'the Chair' if they could keep unemployment to around 5% and inflation to around 2%. Amy enthusiastically explained her theory by using pen, paper and a graph. The dedication of the students was impressive; they worked hard to try and figure out how the economy works. Active learning through group work and collaboration was supported in all problem solving/enquiry based activities. Students were also encouraged to learn from each other. How powerful! The impact of Business Scholars Day was evident in the way in which students grew in confidence throughout the day. Foundation Year students provided group feedback to the wider audience, answered questions in workshops, and also asked questions of current Monash University students with purpose. "Business Scholars Day opens the window to the business world. Through face-to-face Q&A with current Monash students, I have a better understanding of university life and career planning," said Foundation Year student, Devon. Our students learned about Monash University course offerings, participated in two workshops (choice of Business Management, International Business, Accounting and Economics) and were fortunate to gain some real life reflections and advice from Industry presenters. "What attracts me most is the Industry Speaker sessions; they gave us some sincere advice according to their personal real life experience. I have gained a lot by talking to elites from each school and interaction with teachers during the workshops," said Devon.